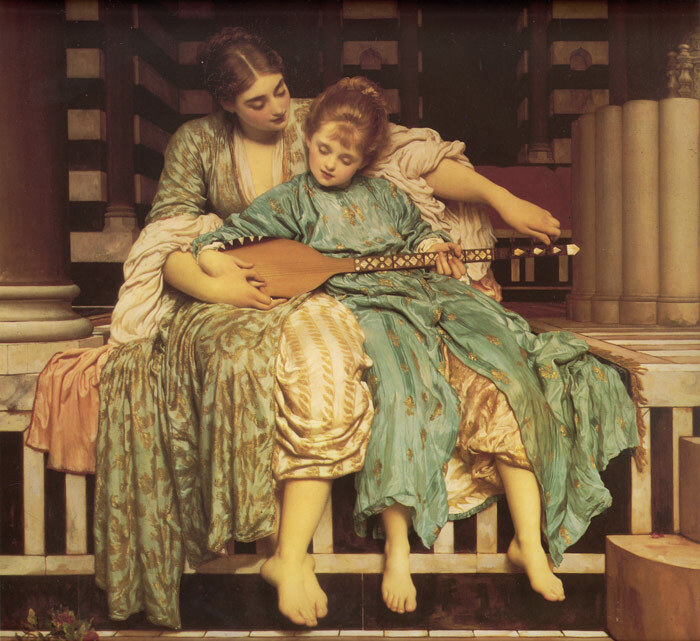 Leighton had visited Damascus in 1873, and the fabrics and the architectural setting in Music Lesson probably derive from that trip. The stringed instrument is a Turkish ‘saz’. The two girls , depicted in Music Lesson are however European, and the younger one is Connie Gilchrist (1865-1946), a celebrated child dancer and pantomime artiste noted for her beautiful hair, who also modelled for Whistler and Frank Holl among other painters. Lewis Carroll took her to see the Royal Academy exhibition in 1877, and recorded in his diary that she had enjoyed seeing herself in Leighton’s pictures. Later she became a popular actress, but gave up the stage in 1892 when she married the Earl of Orkney. SPECIAL NOTE : The painter will make the reproduction as close to the original oil painting as possible. If you want your painting to alter from this likeness, please email us and " Music Lesson, c.1877 " will be reproduced according to your special requirements.